The best early planning and accelerating Da Curve Quadster range ever. More speed, easy planning and better drive in the turn make the all new 2014 Da Curve Quadster range our greatest yet. A perfect balance of speed and turning keep you in the right place of the wave. 3 new shapes have been brought in to the range – a 75, 80 and 86 – the best early planning Da Curve Quadster range in history while the 67 and 91 remained unchanged. New out- and rocker lines with enhanced rail sections look to make this range a must have for the wave chaser! This Power Wave shape continues to evolve into the one-shot wonder. A range of boards that can do the big hits when required, bust out freestyle moves when the waves go flat and boost air to the moon! A completely new range update that makes any condition easy and fun! Early planing gets you up and going through the break with ease, allowing you to pick the ramp of your choosing and blast into the air with solid pop, while the compact outline delivers excellent control in the jumps. 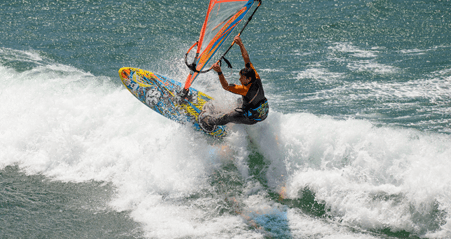 New Shapes in the 96 and 106 sizes are more wave orientated than ever, working perfect as light wind and big waveboards! Triple Fun best describes the 3S boards. You can free ride, bump and jump, bust out some freestyle and smack some lips on these boards and they just don’t care! Arguably one of the best all-round boards on the market, the 3S just gets better and better. The key word to describe these boards is “EASY”. The boards just do what you want them to do, you don’t have to work hard to make them turn, they know how to do it. They jump on a plane with ease and rocket to the moon on the jumps. One board, do what you want! On the wave, the all new rocker line and modified outline shapes ensure smooth bottom turns with excellent drive. The thruster setup offers a surfy feel with slashy turns, and if you want single fin, the choice is yours! Tonky Frans, Davy Scheffers and Antony Ruenes loved these perfect machines that all they asked for were some slight changes with the inserts for the feet and the mast track position. Otherwise, everything was just how they wanted it! We move the front strap’s back to reduce the stance to make them able to get more pop out of it and we moved the mast track back also to get this longer nose feeling. They also asked to get bigger fins on the twister 80, 90 and 100 for even more power and control in a straight line. These shapes have already proven themselves and the boys are making up new moves getting more and more radical. 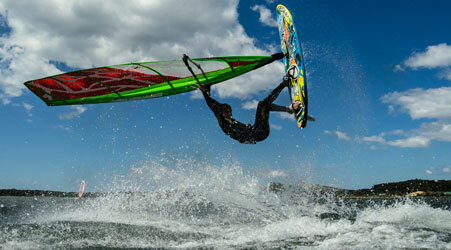 Freestyle windsurfing is all about being creative and reacting to the conditions. The Twister range delivers the right tools for the job.